← New Shoes and another spreadsheet! Another thing I like to do after an ultra race is to write down some lessons I have learnt. But before I do a couple of photos from the race. The first one taken by Steve Walker at the start. You’d have thought that those first few paces were the safest of the race but it turns out they can be quite lethal. If you don’t believe me read Andy Cole’s Race Tale. He tripped on the first step and was almost dnf after five paces! …..
Mr Cole … you can see I’m concentrating on the steps rather than milking the applause like you were!! The second one is taken by Muriel Downie … official Fling photographer. I’m telling Claire that she needs to make sure she records her finishing time with Katrina. Always the gentleman! Despite Stuart Mills challenging me to run sub 9hrs I set off very firmly with a 9.55 plan. I honestly felt this was doable given my training and experience. I was hoping that if things went really well then a pb (under 9.44) was maybe possible but I would be more than happy with 9.59. Over the first 5 and half hours I can honestly say I felt really under control. I was running easily at my pace. I didn’t try and stay with anyone. I had others around me but they weren’t dictating the pace. I was more or less right on my plan right through to about 32miles. Yes it was getting hot but I never felt I was having to push to stay on pace. I walked the hills I normally do and was running everything else. I left Rowardennan feeling so much better than last year and was still confident of that sub 10hr time though I knew there wasn’t going to be much leeway for any struggles. When Debs suggested we ran a bit up the hill out of Rowardennan I was quite happy and felt strong. My first moments of struggle came with about 2miles to go to Inversnaid. Claire and Debs were opening a gap and even though I closed it two times they were away on the third. I don’t think they went any faster. It was just I couldn’t keep up. That was the first time in the race that I felt in was starting to get hard. Once I got to Inversnaid I decided to keep going and see how long it took me to get to Beinglas and whether I had any chance of that sub10. It became pretty obvious that I wasn’t going to make 1.35 for that section and it was a fairly easy and sensible decision to ditch the plan and try and enjoy the rest of the run. As long as I finished I’d be happy. In the end I was about 25mins slower than I’d aimed for but mentally it was so much better to revert to plan b and consider the bigger picture. Looking back I feel I was right to set out to run 9.55 and on a cooler day I believe it was possible. I’m also happy with my mini-splits and will use them again. But I will also ditch them if I fall behind the plan as in the past I’ve tried to make up time and ended up feeling it was a slog to the end. 90th at Drymen, 73rd at Rowardennan, 70th at Beinglas Farm and 75th at Tyndrum. So even though I felt I ran/walked steady over the last 12miles I only lost 5 places to the field. I expected to see that I’d lost a lot more than that. The places are only those who finished so don’t show those who dropped out. One of the things I always use the Fling for is to try out my food plan in a race before the whw. Over the past few months I’ve been experimenting with various foods an wanted to see how they worked in a race situation. Two slices of peanut butter (crunchy) and jam sandwiches – I ate these on a short hill walk fine and enjoyed them. I had a small pot of mashed potato with cheese. I struggled to eat this on the run or even walking up a hill. I ate maybe 3-4 mouthfuls. As it got hotter I found it harder to swallow. I decided to eat my pot of beans at the checkpoint as I realised I was going to find it difficult to eat on the move. I managed well over half the small pot despite being told off by Debs for having a picnic! I took a tablet bar and ate about two bits of it over the next hour or so. At the Inversnaid checkpoint I ate my Muller yoghurt which was lovely and easy to eat. I at another banana on this leg and another couple of bits of tablet. At the checkpoint I ate my Milk Jelly (jelly made with full fat milk). I had no spoon so just scooped it down. Marco was intrigued to know what it was! I also drank my cold milk shake which was heaven. Milk shake made with full milk, two tablespoons of skimmed milk power and milk shake power (strawberry) for taste. I had put in the freezer overnight and it was just right by the afternoon. I ate a few jelly babies and another bit of tablet. Plus Claire shared her licorice with me. Overall I think I’m happy with what I ate. I found it a lot easier to eat the more substantial food at the checkpoints. Maybe I should have eaten my mashed potato at Balmaha rather than trying to eat it on the go. In the whw race I will plan to stop for 5mins to make sure I eat properly. The milk jelly and milk shake was excellent and will be used in the whw especially later on in the race. I think I drank enough water. I never felt really thirsty. I didn’t stop for a wee during the whole race but didn’t feel dehydrated. I drank a fair amount of water at the end but nothing excessive. I started with a short sleeved top and a long sleeved top. It was quite cool to start at 6am but soon warmed up. By Drymen I was still happy wearing both but by the time we arrived at Balmaha I was looking forward to ditching the long sleeved top and it did feel so much better with just the short sleeved top. I put my sun glasses in my Balmaha drop bag and I’m glad I did as it was so good to wear them for the rest of the day as it got hotter. I wore my buff and it really helped. From Rowardennan onwards every chance I got I soaked it in a stream and it cooled my head for a while. As already mentioned my shoes started off a bit worn but were battered by the end. Robert left a comment saying the wear might be from the walking rather than the running. Maybe. We’ll see how these new Saucony shoes wear. 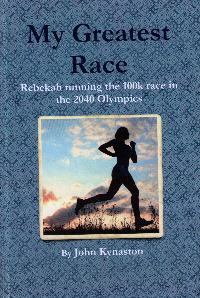 I love to chat to others about their races and read race reports. It’s clear that some struggled a lot more than I did. I’m grateful that I didn’t suffer cramps or I didn’t fall. If you did I hope you recover quickly. But it is also clear that despite the heat some runners ran really, really well. 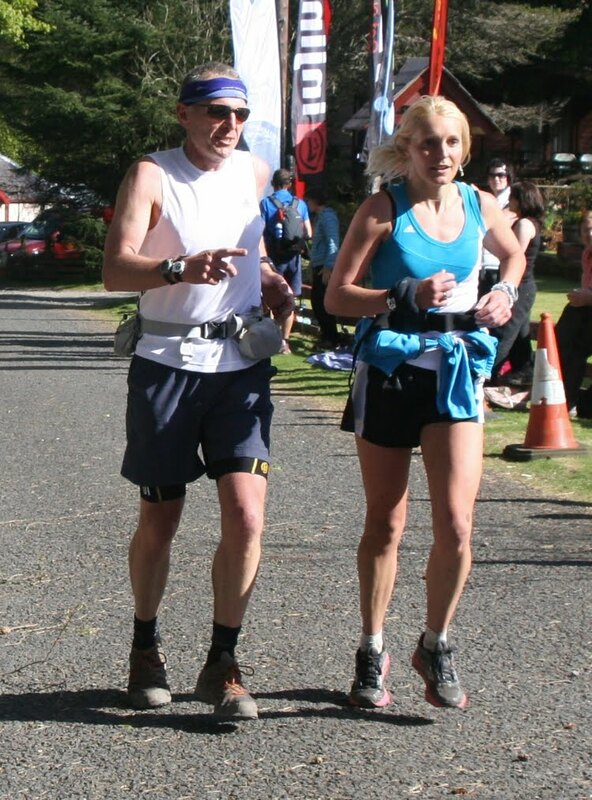 Both Debs and Ross, friends who I train with, dealt with the heat so much better than I did and ran pb’s. So while I’d like to hide behind the excuse that it was too hot I can’t! How do you learn/train your body to run well in the heat? Or do I have to accept that I don’t run well when it’s hot and adjust my expectations accordingly? 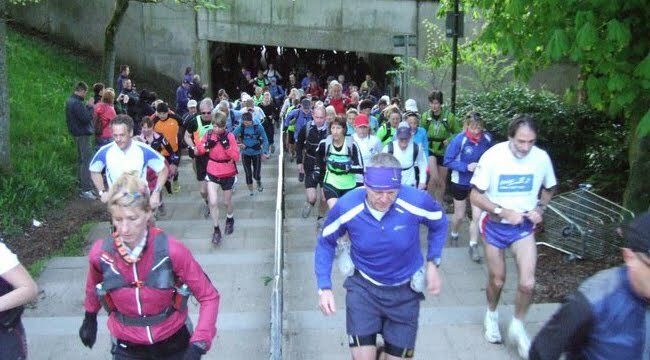 All I know is I really hope it’s an overcast day on Saturday 18th June for the whw race. Interesting info John, and you were obviously well within yourself at the finish (much less tired than I was)so it must have been a good training outing. But it was also interesting to see that you were only drinking 500ml per leg, same as me, and I'm convinced that over the Balmaha to Bein Glas section this wasn't enough. I've been thinking of the sub 9 hour issue and found myself thinking mostly about how to increase the average page for each section by running faster on the flats and downhill’s (especially in the last 12 miles on all the flat and downhill’s), or even getting through checkpoints faster. I finally accepted that due to there probably being more ascent than decent, the only way is to run more of the uphill. The margin for improvement on time is massive when again considering there is probably more up than down. It would be interesting to look at every hill that was walked and work out which could be ran and the effects on the average pace. I know that the issue with walking the hills is to keep some energy in the bag, but hill training should strengthen this issue and it could be more a mental thing when you consider that very soon you will be running almost twice that distance so there must still be lots of reserves left for the 53 miles. Interesting post John – looks like you got most things right. Great idea about the milkshake!